I’ve always been something of a runner. Competing at school. Reasonably pacy at footie (first yard in the mind!). Running to keep fit as I got a little older. But today, a wonderful reminder of the healing qualities of going for a run. The wellbeing dividend of getting outside and immersing yourself in pounding the pavement is a great release and hugely rewarding. 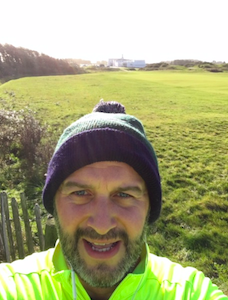 After my time in hospital (which started three years and three days ago now) and my subsequent battle to find the right balance in my life – and for my mental health – running played an important role. I lost two stone two years ago through a combination of running and six month off alcohol. I have reintroduced the drink again – all things in moderation – but tried to keep consistent with my running. The truth is that I don’t always succeed – my actual regime is four pieces of significant exercise per week (e.g. a run, a game of golf etc) but events, events dear boy sometimes get in the way. Every time I run again I am reminded how enjoyable and therapeutic it is. There is the well-known chemical releases that help body and mind during and after exercise but for me it is the solitude and peace, alongside the chance to breath in some fresh air which really helps. I am not totally alone; I permit podcasts and playlists to join me, depending on my mood. Today’s run was a music run, with one of my inspirational (and cheesy) playlists. Not Rocky, but not far off. I made the same promise to myself today when I got home; I must do this more often. Running is one of my ten or so interventions that help me to keep my wellbeing heading in the right direction. It is no exaggeration to say that running helps to keep me on an even keel – to keep me well. All the more reason for keeping it up. I especially enjoy running on Christmas Day, when I join Daley Thompson and my old mate Dave Leigh in refusing to take a day off just because its Christmas. Knowing that others will be resting – a chance to get ahead. If it’s good enough for that greatest of great athletes, its good enough for me. And I’m sure for Daley too.